Hey y’all! Long time no post, I know. But it is because I have been doing research! We’re gonna start with the more basic stuff and get into the more awesome stuff down the line, but let’s just say my skills have begun to grow beyond mere cooking and baking (though those are getting pretty good too!) and have entered the realm of… other stuff. Cauliflower mashies! These babies taste fresh and light, and while they don’t quite mirror their brother the mashed potato in every way, they’re a darn good replacement, especially for those looking for some lighter fare now that it’s getting warmer outside. These go great with brats and burgers, steak, certain tofu dishes, chicken… basically anything. They’re an awesome, versatile side and they’re super easy to make. Also don’t rag on my food-tography. I was yelled at for not having any pictures of the stuff I make (because honestly I just always forget) so… enjoy it, or scorn it in silence! Step 1: Fill the bottom of the pot with water and balance the colander on the mouth of the pot. 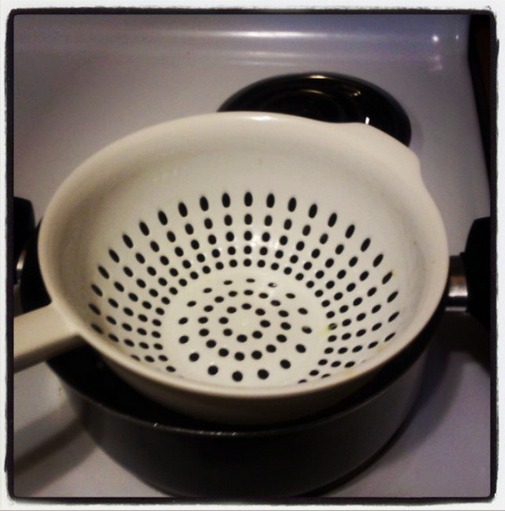 The bowl of the colander should go inside the pot, but the water in the pot should not be high enough to get into the holes of the colander. You’re going to be steaming your cauliflower! Step 2: Chop up your head of cauliflower. Discard the leaves, but otherwise it doesn’t really need to be pretty or cut a certain way, just as long as the pieces are large enough not to fall through the holes of your colander. 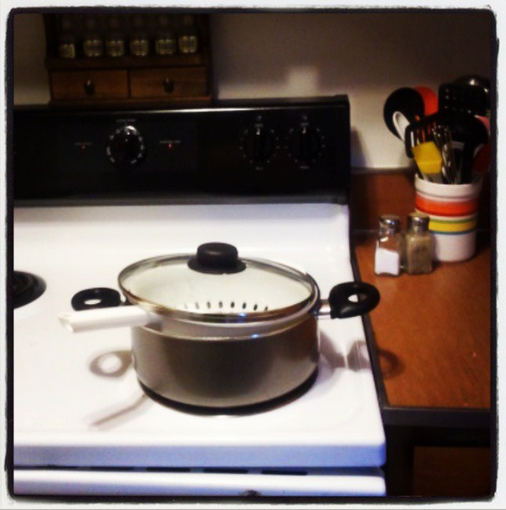 Step 3: Turn the burner under the pot on high and place your cauliflower choppings into the colander. Balance the lid over top of the colander. Step 4: Let your cauliflower bits steam until your fork can stab through them with very little resistance. Step 5: Once your cauliflower is steamed properly, empty your pot of its water, shake the water from your cauliflower (over a sink preferably), and put your cauliflower bits directly into the pot. Step 6: (Do this carefully if you have a teflon-coated pot as you don’t want to scratch it) Take up your mighty fork like the trident of Poseidon and mash the cauliflower. Add butter and pepper to taste, or whatever you do to fancy up your mashed potatoes. 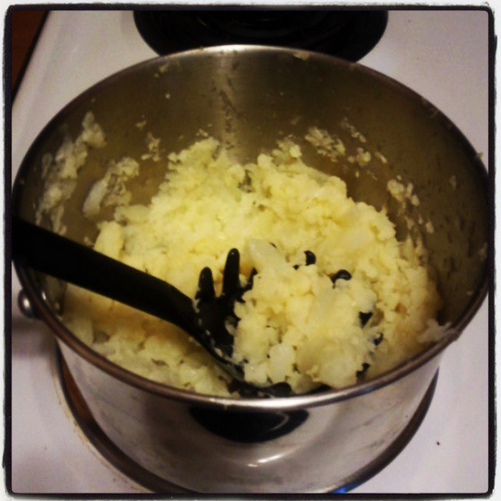 Step 7: Smash that mash and come back to tell us how it turned out! Thanks for reading, guys! As always, like, comment, share, subscribe! Keep your eyes open for more from Molly Stewart Living, coming soon. 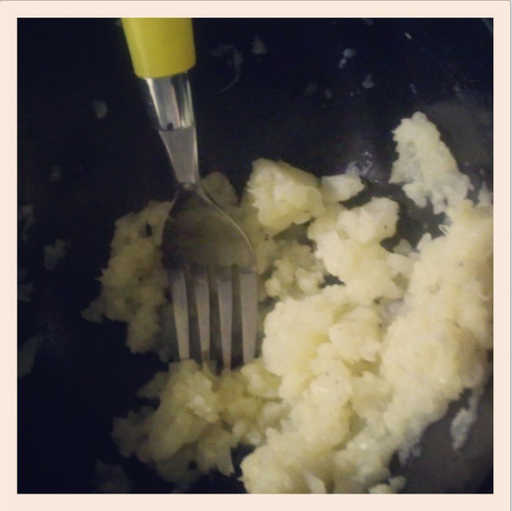 Posted on May 20, 2013 by Miss Molly Stewart	• This entry was posted in Gluten Free, Lactose Free, Recipes!, Vegan, Vegetarian and tagged budget, cauliflower, easy, food, gluten free, lactose free, mashed, recipe, side dish, vegan, vegetarian, veggies. Bookmark the permalink.